Recipes are so much more economical if you use fruit and vegetable that are in season. 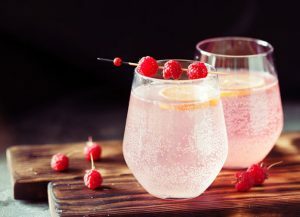 A refreshing drink for Spring. Combine the raspberries, cucumber, spearmint, strawberry juice and lime juice in a tall cool drink glass. Process with a hand-processor until blended. Place in the fridge for 30 minutes. Add the ice cube, gin and tonic water. Place an extra raspberry and spearmint leaf on top for garnishing.